We are all familiar with the wedding vow ‘To love and to cherish, from this day forward till death do us part.’ Well what if you woke up from a coma, not remembering that the man that stood before you was your husband or what you had done in the last few years of your life? 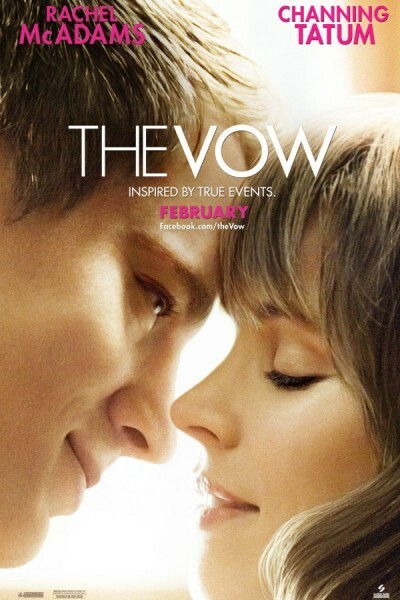 The Vow is a bittersweet amnesia story that begins with Paige (Rachel McAdams) unfastening her seat belt to lean in and kiss her husband Leo (Channing Tatum) one snowy night in Chicago. Before they can even touch each other’s lips they’re hit from behind by a truck and she goes through the windscreen. When Paige comes out of a coma some weeks later with no memory of her husband or marriage she tries to fill in the gaps of her failed memory. Instead of a reunion with her husband, Paige reverts to her former life with her stuffy, upper-middle-class parents and Leo has to make her fall in love with him again. A sweet story that leaves you wanting more. The movie is cliche but that’s sometimes ok for the type of movie it is. Of course Tatum and McAdams are brilliant actors, a perfect cast for this film in my opinion. I won’t reveal anymore, don’t want to spoil it for you! But I would deffinatley go and see it at the cinema if you have the chance!